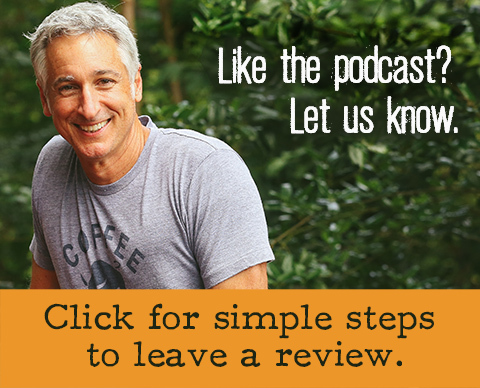 Over my many years of traveling the country touring gardens both great and small, I’ve managed to summarize what I believe are the five biggest garden mistakes made by gardeners in their home landscapes and gardens. They also happen to be some of the most common. 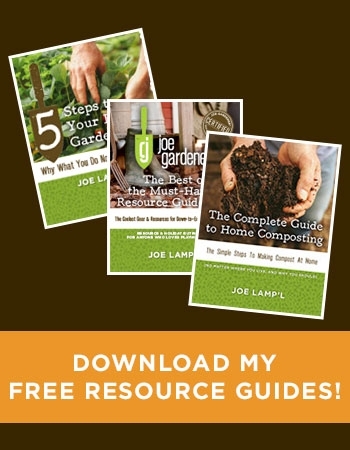 In speaking with horticulturists and gardeners at every level, as well as decades of experience gardening personally and professionally, I’ve learned a thing or two about what works and what doesn’t when it comes to getting great results. If you find yourself a party to some of the following practices, you are not alone. I too am guilty of several of these over my gardening journey. And that’s the point. 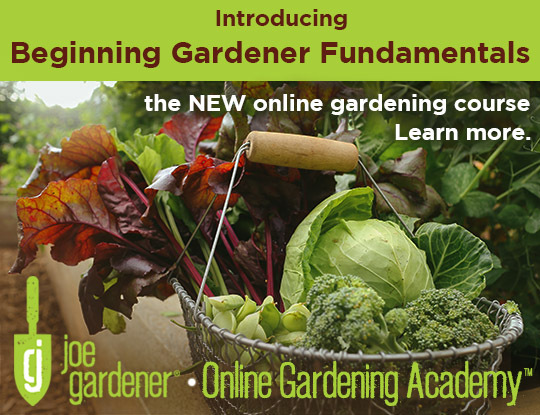 As gardeners, we are always learning, and evolving in how we go about creating beautiful spaces. I hope that we are always working to be better, smarter and more environmentally responsible gardeners. 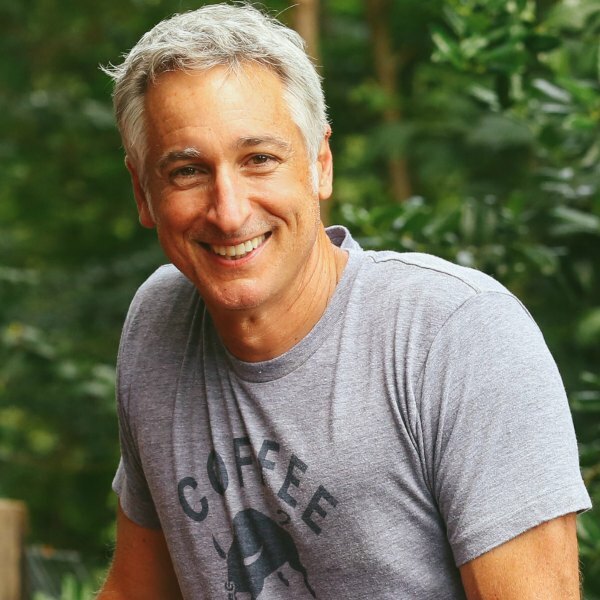 Here is my list of the five biggest mistakes gardeners make, as well as easy opportunities for dramatic improvements. While clay soil is not bad, it’s dense and doesn’t drain well. Adding organic matter over time can dramatically improve everything about this soil. Feed the soil and let the soil feed the plants. I say it all the time, and it’s a mantra I live by every day. 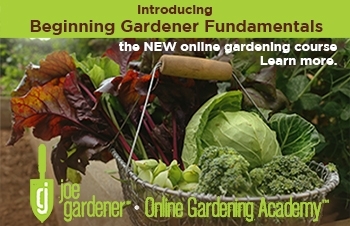 The health of your garden and everything planted in it comes down to the health of your soil. 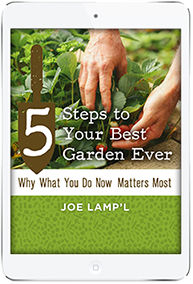 Unfortunately, gardeners and weekend warriors tend to skip right over this most important step in their haste to get whatever planted and hope for the best. I think of unhealthy soil like a bank account where you keep taking withdrawals without making deposits. Eventually, your account is depleted. It’s the same with soil. Plants will continue to make withdrawals of nutrients and resources from the soil. But unless you continue to invest resources back into it by adding organic matter and compost, you’ll have what I define as dirt – what soil is after it dies. Healthy soil (the kind you take time to build with organic matter) is full of beneficial microorganisms that provide nutrients, fight soil-borne pests and diseases, and help chemically bind or lock up many harmful soil contaminants. 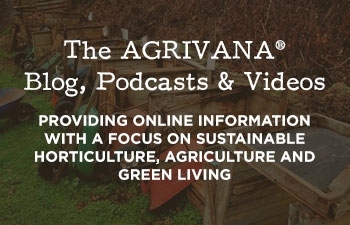 By investing time in making your soil better, you create an environment there that provides everything growing in it access to all it needs when it’s needed. Drainage is better, water retention is better, and access to nutrients is far more efficient than choosing a synthetic fertilizer route. Suffice it to say healthy soil is life; a subterranean biodiverse environment is teeming with billions of organisms working in harmony to foster robust growth above ground – naturally. A common issue with poor water management is watering overhead, and/or at the wrong time. This image captures both problems. Not enough water actually reaches its intended target. 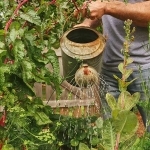 You might be surprised to know that more plants die from over watering than under watering. While we have the best of intentions, in poorly drained soil (a common problem in much of the country), soil pools below the surface, oxygen is displaced, and plants eventually drown. The key to proper watering is to give newly installed trees and shrubs the water they need at the time of planting and for several weeks beyond so they have all the water needed to recover from the shock of transplant and time to settle into their new home. You never want the root zone so wet that soil remains soggy. A simple but effective way to know if your plants need more water is to do the finger test. Simply insert your finger as far into the soil as possible. Then remove it. If your finger comes up with soil covering your finger, there is sufficient moisture. Conversely, if your finger comes up dry and clean, or you can’t even get it into the soil past the first knuckle, the soil is too dry, and you need to add water. And use your eyes. Once you know your soil is wet enough, you need to ask is it too wet. With visual and physical inspection, it’s easy to get a sense of what looks and feels excessively wet. You definitely don’t want that. Constantly observing your plants and trees will also guide you to their need for water, and may be your first clue that intervention is needed. While drooping foliage can be a sign of drought stress, excessive water can also exhibit similar signs. However, limp foliage that feels dry and is green or trending to brown needs water. Foliage that is limp, and green tending to yellow, and does not feel dry or crispy is likely a case of soil that is excessively wet. The next hurdle is taking the time to ensure new plants and trees receive supplemental irrigation until they are fully established. How long is that? It depends. At least a matter of several months. In hot, dry conditions, it can take a year or longer. Use the finger and visual monitoring tips above to get a sense of how long you need to supplement watering. 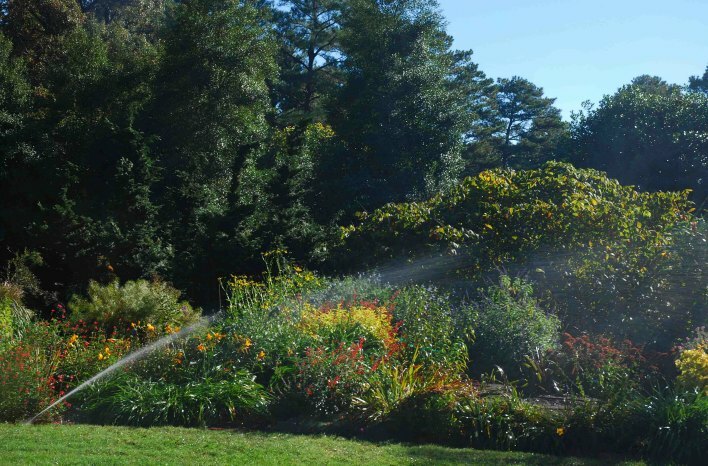 The best methods of delivering irrigation are with soaker hoses, drip irrigation, and what I call a bubbler (although a soaker attachment) is likely the better term. Each method delivers water slowly to the root zone to provide enough for roots to take up what they need while providing enough residual moisture for later. 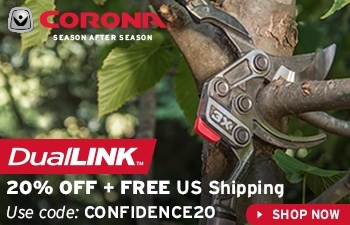 Soaker hoses are best for trees with a large root area that you need to cover. I wind a 25 or 50-foot soaker hose outward, starting from near the trunk. My goal is to provide enough coverage to reach the drip line (where the width of the tree canopy ends). 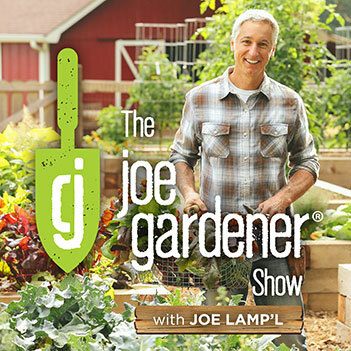 Drip irrigation is ideal for shrubs and containerized plants or trees. These methods provide pinpoint watering with a controlled flow rate to deliver a known amount of water over a specified period. Bubbler/soaker attachments are a great way to deliver a thorough soaking quicker than the other options above. The key to using this system effectively is when you attach a quick shut off valve to the hose end. The lever on the valve allows you to fine-tune the volume of water or flow rate exiting from the bubbler. For each of these options, a portable time is a must (unless you like constantly running back outside to shut the water off. And that’s assuming you remember to do so). I strongly advise adding a simple timer to put your irrigation on auto-pilot. 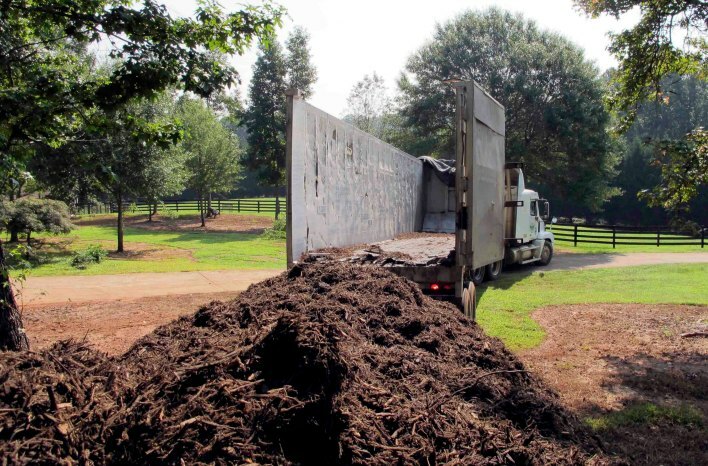 At my farm, I use so much mulch; it’s delivered by a tractor trailer. A 2-inch layer spread over all my beds will do so much to easily justify the investment. While I’d be hard-pressed to find anything, I think is better for improving the health of any garden than compost, mulch is definitely a close second. Just don’t over-apply it. 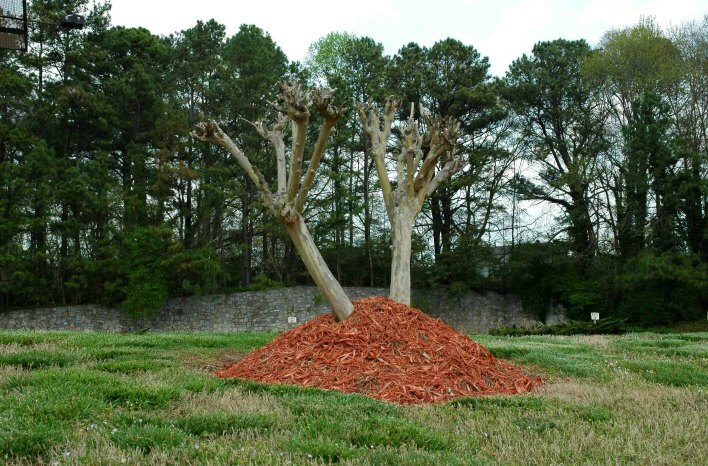 Like in the “mulch volcano” pictured in the featured image. While there are only about two things you can do wrong when using mulch, this image captures both: too deep and too close. 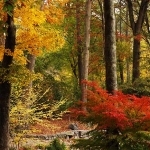 Never apply mulch against the base of a tree or shrub. It’s a pathway for excess moisture, pests and diseases to gain easy access to the plant. Similarly, too much mulch is just as bad as not enough. Anything more than about two-inches is too much for water to pass through the mulch for plant roots to be able to utilize it. And for the record, there’s a third crime against horticulture we call “crape murder.” Cutting back a crape myrtle or any tree this severely is excessive. Considering all the benefits mulch provides, except for compost, nothing you can do in your garden or landscape offers more benefits. Here is a partial list. Weed suppression – When a layer of mulch is added to exposed soil, sunlight needed by many weed seeds to germinate is blocked. Mulch is a simple but highly effective natural way to dramatically reducing the number of weeds in any bed or garden. Protection from soil erosion and runoff – A modest layer of mulch (about 2-inches) will buffer the impact that rain has on exacerbating soil runoff conditions. Conversely, that same mulch layer mitigates the drying effects of the sun beating down on exposed soil. In such cases, soil can quickly become so dry and hard, it becomes impervious, and water runs right off its surface, taking precious topsoil and soil contaminants with it as it heads towards the closest watershed. 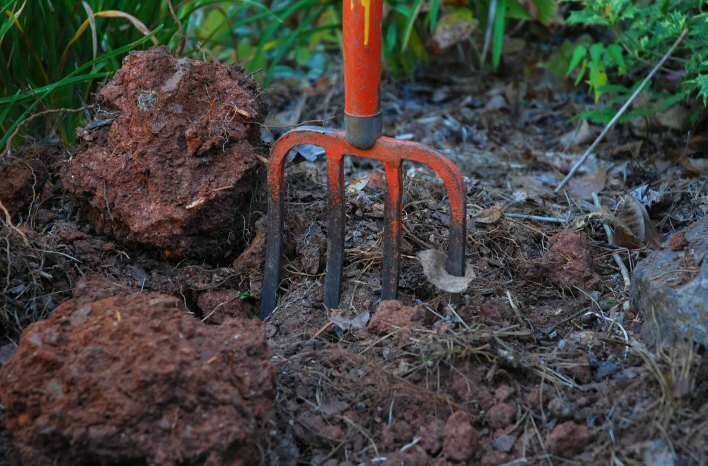 Soil improvement – As natural mulch breaks down, it returns organic matter and compost back to the soil. It’s a hands-off way to improve any soil as it slowly decomposes. Reduces evaporation and retains vital soil moisture – A modest layer of mulch acts as an insulation barrier from evaporation. Keeping moisture in the soil is a constant challenge. Mulch not only keeps more water where it’s needed, it also reduces the amount of supplemental water needed by plants and trees. Suppresses soil borne diseases – That same layer of mulch over the soil surface prevents many soil borne diseases from splashing up onto plant foliage and infecting plants. 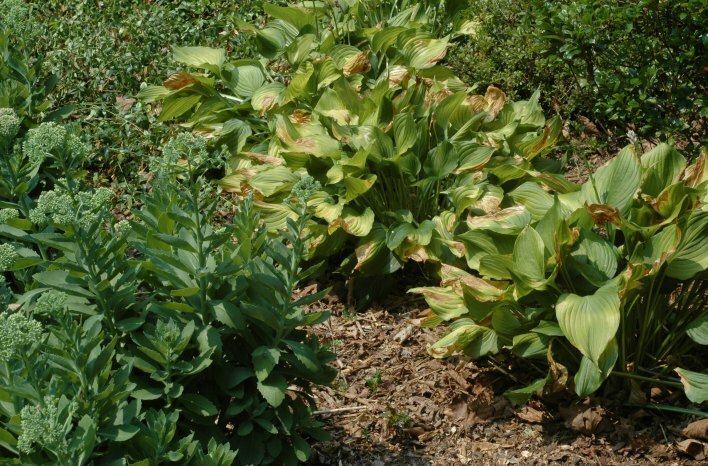 Shade loving hostas planted in full sun are showing the signs of distress. Sun-loving sedum is thriving in the same environment. The right plant-right place is the key to proper placement. We are an impatient group. We want a lush, full landscape now. Accordingly, our drive for instant gratification in our landscapes can lead to long term problems. When we fail to make a note of a plant’s cultural requirements by considering proper spacing at maturity, light exposure, soil preferences, and more, we set our plants up for eventual trouble. Unfortunately, we’re all too quick to throw chemicals at the problem. That’s never the right solution. A plant in distress because it was improperly planted is never going to thrive until it’s placed in the proper environment. When we plant too closely, as plants continue to grow, light exposure and air circulation getting into the plants is drastically reduced. That leads to disease and pest problems which frequently results in sick or dying plants. 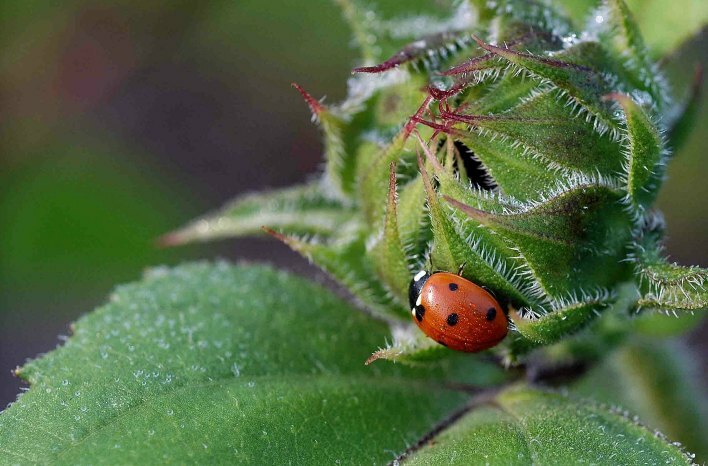 Indiscriminate use of pesticides could easily kill this beneficial lady beetle. Without the good bugs, the bad bugs come back stronger than ever. As an organic gardener, keeping synthetic chemicals out of my garden and landscape is a given. In fact, I just don’t see the need for them. By focusing on the health of my soil and planting a diverse assortment of plants and trees that attract a wide array of birds and beneficial insects, my lawn and garden is lush, and never overcome with an invasion of any pest I can’t handle with ease. 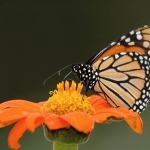 All too often, many gardeners and weekend warriors are quick to reach for whatever chemical they can use to kill whatever bug or caterpillar they see in their garden. What they don’t realize is that only 3% of insects are considered pests. The 97% that are either beneficial or neutral at worst are victims of our quick fix to overly aggressive pest control. At the same time, we are wiping out critical food sources for birds and other wildlife that depend on them for survival. In this age of google, why are we not taking 3-minutes to search and identify what is likely not a pest? Sadly, when we kill what we think are bad bugs and insects in our landscapes, we’re killing beneficials too. And they won’t recover fast enough to keep up with real pests that are sure to arrive in the absence of predators to keep them in check. 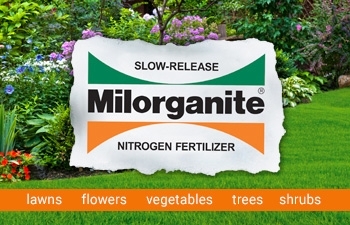 Fertilizer is something else I believe is used too often in gardens and landscapes. Focusing on soil health provides all the nutrients plants need to thrive. Especially when we focus on proper irrigation and providing the appropriate cultural requirements for our plants and lawn. 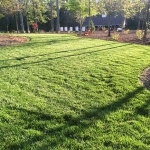 While fertilizers work, they can be highly concentrated and quickly harm or kill our plants or lawn when applied incorrectly. Moreover, synthetic fertilizers are salt-based – which does nothing to improve soil health. In fact, it has the opposite effect. So, you have two choices. You can feed your plants, or feed your soil, and let your soil feed your plants the way nature intended. For me, it’s an easy decision. I equate it to a junk food diet vs. a whole foods diet. I’m in it for the long haul. How about you? 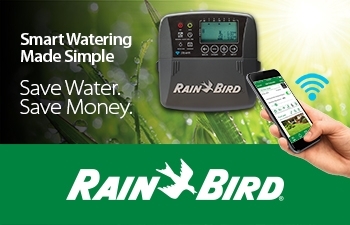 Rain Bird – Our podcast episode sponsor and Brand Partner of joe gardener®.